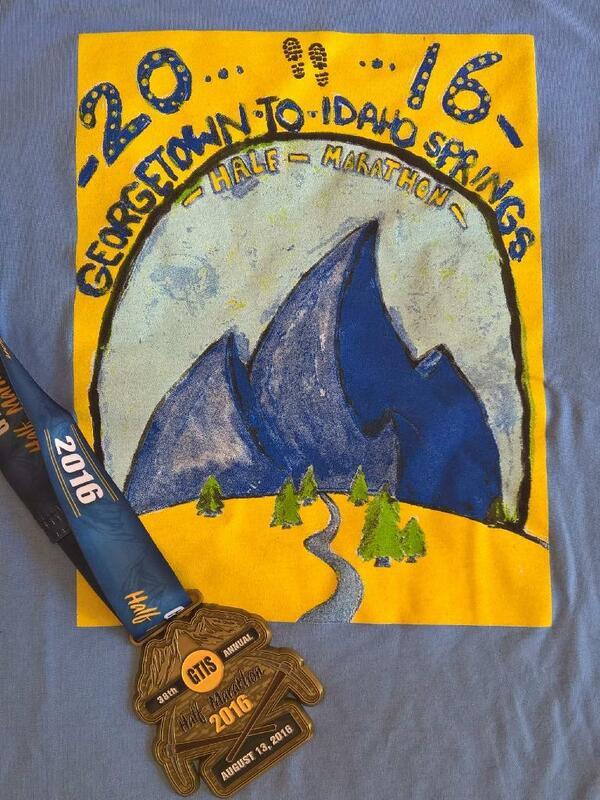 When I signed up for the Georgetown-Idaho Springs Half Marathon, this was supposed to be my “A” race for the summer—especially after a disappointing performance in the Slacker Half Marathon in late June. But then in mid-July I fractured my left elbow in a bicycle commuting accident. To avoid the risk of displacing the broken radial head any more, my doctor strongly recommended avoiding impact and jarring motions (i.e., “don’t run”) for a few weeks. I heeded his warning and only tested jogging with the not totally healed arm on an easy trail run/hike a couple days before the race. It seemed fine. Realistically I was not going to be in good shape to run 13.1 miles at anything approximating race pace so I set my goals pretty low: get in the miles while beating my very first half marathon time (1:53:12) from 1998. This would basically be a training run, but one that I would wake up at 3:30 a.m. in the morning to drive to and park at the race finish in Idaho Springs, about 90 miles from where I live. I got there with enough time to nap in the PT Cruiser for 45 minutes before hopping on a yellow school bus that drove runners to the start in Georgetown. Then I had an hour to stand around and shiver before the 8:00 a.m. start by Georgetown Lake with the air temperatures in the low 50s Fahrenheit. Note to self: always wear warmup clothes and take advantage of the bag drops before a race. I started the run behind the 1:45 pacer. About a mile-and-a-half in, I passed her as the pace seemed a bit too easy. Then I knocked off the next six miles at roughly 7:30-7:40 pace. Until that point, my calves actually felt less fatigued than in the Slacker Half Marathon, but after Mile 8, they started to protest. My quads were also tiring and despite only having to breathe in and out every three steps at times, I never felt entirely comfortable with my breathing. The sun was also bearing down on my face and I was starting to overheat. For the final five miles, my mile pace crept above eight minutes. By Mile 12 the wheels were starting to come apart and with three-quarters of a mile to go, the 1:45 pace group passed. There was no fight in my soul and I made no effort to keep up or even keep them in sight. I did manage to sprint the final 100 meters and pass two women. The finish time was 1:45:23 (8:02/mile) so I missed out on both a sub-1:45 finish and a sub-eight minute per mile pace. But I did comfortably beat my first half marathon time from when I was 18 years younger. And it was a quality training run, the first in about a month. For the two days afterward, my legs were hobbling down stairs with a severe but satisfying soreness that is usually associated with a full marathon, not a mere half. We will see what I can do in another month at yet another 13.1 mile attempt, this time on a mixed-surface, rolling course in Westminster, Colorado.